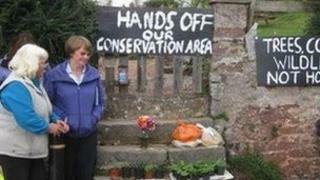 A row has broken out between a conservation charity and people living in the Devon village of Maidencombe. Torbay Coast and Countryside Trust (TCCT) wants to build four homes and a hall on the edge of the village's green. But the plan has angered residents who said it would be "out of keeping" with the area. TCCT says it needs the money from the development and is offering a village hall as part of the development. The proposals, which are have been put out to consultation, have led to a blog page in opposition being set up, as well as a petition. Villager Jim Campbell said: "Villagers love the natural beauty of the place. "A development would rip the guts out of the village." Fiona Bruckin, landlady of the Thatched Tavern pub in the village said: "People come to Maidencombe because it is the way it use to be. "They don't want to be looking at a manicured village green with big houses." Dominic Acland, director of TCCT, which leases the green from Torbay Council, said: "It would be an appropriate and sympathetic extension to the village. "Conservation does not have to mean a total freeze on development." He said the charity was "pretty pushed for cash" and the scheme would help build up its cash reserves, but the TCCT was also "trying to address some issues" in the village. He said a faulty septic tank near the green would be replaced and re-sited. A public meeting is being held at 19:00 BST at Brunel Manor conference centre in Paignton.